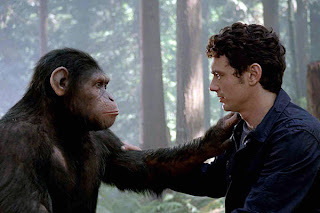 Article first published as Movie Review: Rise of the Planet of the Apes on Blogcritics. When you go to watch a summer blockbuster, you expect a popcorn flick that doesn’t really stimulate the brain beyond bringing about pleasure, joy and excitement. With Rise of the Planet of the Apes, this movie stimulates far more, if you’re open to listening and receiving what is being said. Rarely do we get a popcorn flick the makes us question moral values, explore the relationships between humans and animals, deliver a compelling story and still toss us into an exciting action film. This movie has all of that. A prequel/reboot to the popular Planet of the Apes franchise, this is easily just the latest chapter that could become a whole new series of movies if they keep the formula used for Rise of the Planet of the Apes. Will Rodman (James Franco) has a dream to cure the deadly disease Alzheimer’s. The disease plagues more and more people every year, including his father. Using apes as the test subjects for a fresh new drug, it shows great promise to become a cure for this fatal disease. But after a mishap in the lab, the plug is pulled and his dreams crushed, until he finds an unlikely surprise. A baby ape named Caesar (Andy Serkis) whose mother passed the drug to him before birth. Will brings Caesar home to join his family and meet his father, John Rodman (John Lithgow), who is the source of Wills determination and drive to find a cure to Alzheimer’s. We get to experience much of Caesar’s life as he grows from baby ape to adult. Will later falls in love with a woman, Caroline Aranha (Freida Pinto), who becomes a major source of support for Will. Rise of the Planet of the Apes is a very enjoyable movie as I was pleasantly surprised with almost every aspect of the film. Being a fan of Planet of the Apes since the very first movie, I had expectations for this film to be just as good. What I was met with was a surprise that wasn’t expected. The movie isn’t simply a sit down and enjoy movie as most summer films, but rather a movie that makes you think. Testing of drugs on animals, is it right or wrong? Is it ok to do these tests if it means saving millions of human lives? Are we prepared for the potential consequences of these tests? You find yourself asking these moral questions amongst others as the story unfolds. Before the movie ends, all of your moral questions you may be asking yourself are met by one harsh realization. What has transpired in this movie could honestly happen. The movie really does take the time to be much more than the typical summer action film and is successful at every turn. If you are a fan of Planet of the Apes, you will be pleased with the many moments in the film that reference back to the original movie. From quotes to events in the story that link it to the first film. The question is do you have the eye to catch it all? This made the movie a lot of fun for me, as it was an obvious nod from the creators. They didn’t go for a prequel/reboot that ignored what’s already there, they embraced it. The special effects in the film are top notch. From beginning to end, you will be surprised at just how realistic the apes look, move and interact with one another. The effects make the apes so life like that if you are an animal lover it is a little heart wrenching to see one die, even though you know it’s a CGI creation. This adds to the emotion of the movie as it hits you like you wouldn’t expect. One of the biggest successes of the film is turning what was the antagonist of the previous films, into the protagonist. If you love animals like I do, you’ll find yourself cheering for the apes wanting them to win. And I wasn’t the only one, which was made apparent by the loud applause from the rest of the theatre I was in. The movie is a huge hit on what could have been a disastrous miss. I loved every moment and would definitely spend the money to see it in theatres again. With compelling story telling, great action, and moral dilemmas, Rise of the Planet of the Planet of the Apes will bring you in, hit an emotional chord and leave you happy with how it all wraps up. I highly recommend seeing this film, and if you’re an animal lover, you definitely won’t regret it.